If you are thinking of changing the mood in your kitchen, a fresh coat of paint might just be what you need. Have a look at new paint colours for your kitchen to see if they will make a difference. We also tell you which combinations are best to go with different types of kitchen walls and accessories. Deciding on the tone you want is the first step before choosing paint colours for your kitchen. A lot also depends on the furniture you have in the kitchen as well as the flooring. As a rule, cool colour tones will go well with blues, greens, and yellows. If your kitchen has brown or dark furniture, you can go with practically any hue. There are plenty of home styling and design websites that allow you to experiment and play with colours before heading out to the shop to make a purchase. Hence, you can decide if you want warm or cool tones, paint a wall only with bright colour or redo the entire kitchen. Examples of sites include Dulux (dulux.co.uk), Farrow & Ball (farrow-ball.com) and UK TV (uktv.co.uk). Wall treatments which can change the look of a wall in your kitchen drastically are also available in DIY shops. Go for stripes and other patterns which can improve how your kitchen looks. Blue is a cool tone and looks great on a kitchen. Combine white cabinets and cupboards with a blue wall or tiles for a stunning effect. Grey and blue combinations also look stunning. Lime green, turquoise and other shades of this colour can make a lovely backsplash in the kitchen. 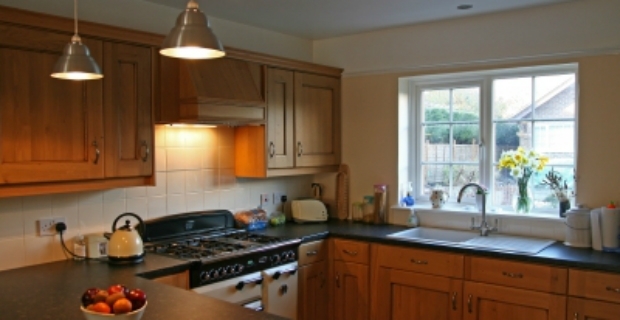 Yellow is warm and will give the effect of space in your kitchen. It is a popular colour because it is easy to blend this hue with both dark and light kitchen furniture. It also reflects a burst of colour to a dull room. 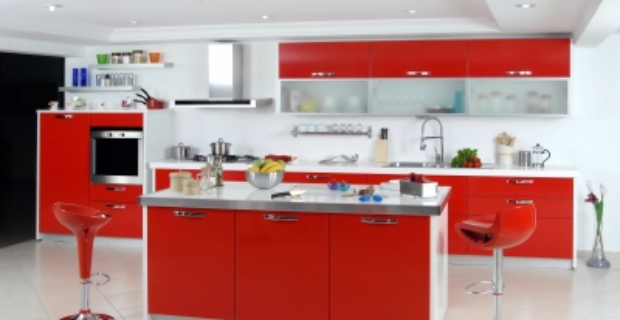 Painting your kitchen red might be considered bold, but it gives a warm, cosy and regal atmosphere. Combine with white for a chic and gorgeous effect. When it comes to paint colours for the kitchen, a lot of designers favour neutral and pastel colours. Yellows and earthy colours such as brown and grey are also popular. This is easy to see why. These colours bring cheer to the kitchen and are easy to coordinate with other paint colours in addition to furniture and appliances.